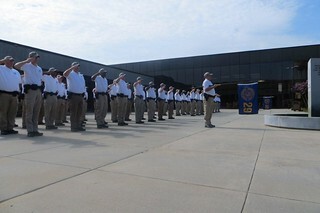 The Georgia Public Safety Training Center in Forsyth conducts the Basic Police Officer Training program. Candidates who wish to become law enforcement officers should carefully review the requirements for Becoming a Police Officer in Georgia. Upon completing all prerequisites, candidates may enroll in the 408-hour Basic Law Enforcement Training program at GPSTC Forsyth. The Basic Law Enforcement Training program is typically taught eight times per year at GPSTC Forsyth.